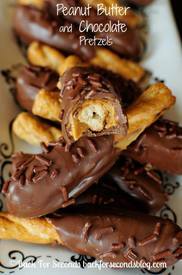 Peanut butter & chocolate pretzels! Peanut Butter and Chocolate Pretzels are an easy, no bake treat that takes just minutes to make! It’s a sweet and salty snack that everyone loves! I don't know anyone who doesn't love these! Perfect for Super Bowl this Sunday!